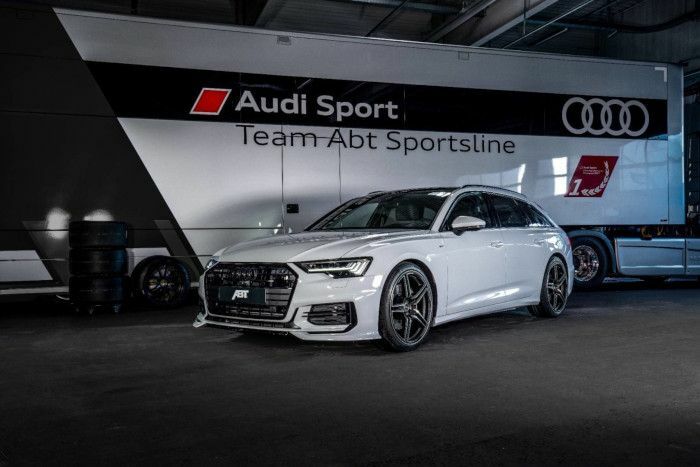 ABT makes a Audi A6 Avant 3.0 TDI tuning model for the Geneva Motor Show, which is located next to the ABT electric vehicles on the stand. Geneva is famous for its many sights, including Jet D'Eau. The Jet d’Eau fountain with its up to 140 meters (460 ft) high and bright white water jet is the best known attraction of Lake Geneva: Thanks to a pump performance of 1,000 kW, the cool water is jetted upwards with up to 200 km/h. The glacier white paint of the ABT Audi A6 Avant represents a less hurried state of the element water. Still it should be clear that the famous “oversize fountain” can’t keep up with its top speed. The acceleration of the Audi is also beyond any doubt: 100 km/h can be reached in just 5.5 seconds – two tenths faster than with the production version with 286 HP (210 kW). After all, the performance of the diesel engine has been increased to 330 HP (243 kW) thanks to the ABT Power boost which uses the auxiliary ABT Engine Control (AEC) unit. Those who want to admire both the deservedly famous Jet d’Eau and the latest coup of ABT Sportsline, should visit Switzerland on March 7–17, during the legendary Geneva Motor Show. The largest tuning provider for Audi and Volkswagen vehicles will exhibit different models and products at stand 1244 in hall 1. While the arguably most famous water fountain of Switzerland is only able to bring real joy while in action, the ABT Audi A6 is also greatly appreciated while stationary at the exhibition stand. The tuning A6 Avant got discreet appearance but very convincing aerodynamics package. 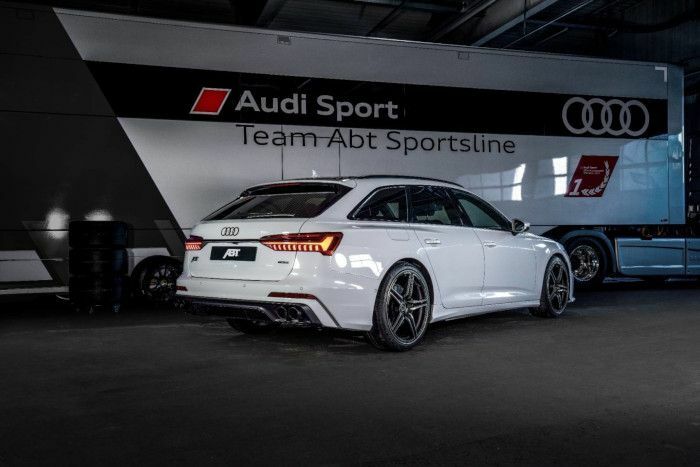 The ABT A6 Avant equipped with an ABT front skirt add-on including a glossy black spoiler blade and a decorative strip front. The rear of the vehicle is dynamically enhanced by an ABT rear skirt add-on with glossy black diffuser. Matt black ABT tail pipe trims with a diameter of 89 millimetres give a quick hint of the fact that the engine located at the other end of the vehicle is not a singing bird but rather a bass machine. The Avant certainly doesn’t look innocent due to the black optics package with glossy black Audi rings. Consequently, the ABT Sportsline stylists have treated the A6 with 9.5 x 21 inch ABT FR rims in mystic black with a 38-mm offset. Naturally, the corresponding 255/35 R21 tires from partner Continental are also black. The ABT start-stop button cover on the inside and the ABT integrated entrance light, effectively projecting the tuning provider’s logo onto the ground – especially at night – are also worth mentioning. Still the Jet d’Eau is also said to be pretty spectacular in the dark.